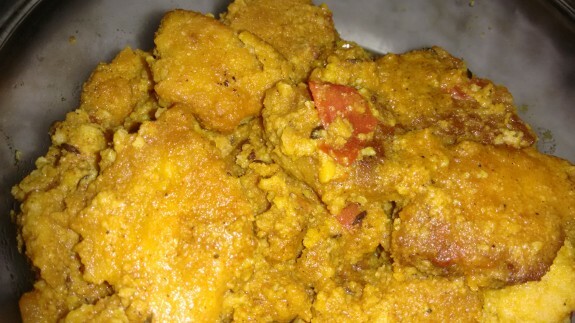 Dhokar Dalna is the speciality of Bengal and it can’t be called as easy recipe as it shows. 1. Soak the chana dal fir 5-6 hours in normal water. 2. Drain out the excess water. 3. Add 2 tsp ginger chilli paste and 1 tsp salt and sugar. 4. Grind everything using a mixer to form a smooth paste of Chana dal. 1. Heat 2 tsp oil in a pan. Add the Chana dal paste and fry it until the semi liquid state is lost. It will become a light dry paste. 2. Take a dish or steel plate and spread 4-5 drops of oil on the surface. Spread the oil. 3. Take the paste from the pan and spread it evenly on the dish/plate. 4. Cut the spread into diamond shaped cubes and keep it aside. 5. Now tale another pan/kadai and add 5 tbsp oil into it. Allow it to heat and then deep fry the cubes in this oil. 6. Keep the Fried cubes aside. 1. In the left over heated oil, add cumin seeds, bay leaves and fry it. 2. Add the chopped tomatoes and allow it to cook for 1-2 mins. 3. Add the ginger chilli paste, turmeric powder, red chilli powder, cumin powder, salt and ¼ tsp sugar. Stir everything well. 4. Add 2 cups of water and let it come to boil. 5. Add the fried cubes and allow it cook for 5-6 mins. 6. Add little salt, garam masala powder and ghee to taste. Cover the pan with lid and cook for 1-2 mins. Turn off the flame and serve it with rice.